In case it has not been noticed, there is a Recent finds tab. Recently, I got interested in sails (researching the barque Bostonian was one factor). Salem, now, has a large sail maker. How did Salem fit into the business in earlier times? One other motivation was that John Goff has written about ropewalking which Salem was involved with. Heather Wilkinson Rojo wrote about visiting the museum in Boston. 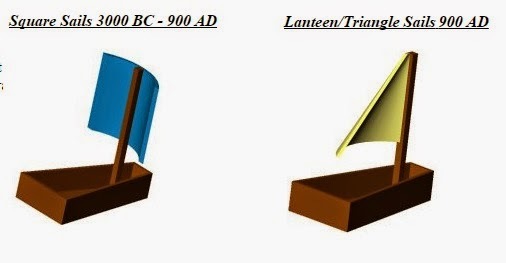 Sails, and their makers, seem to be taken for granted. Perhaps, the whole thing is considered of lessor intellectual fare. But, not. At the Recent finds little bit on sails and materials, I put links to conferences and academic work. Especially, I found the Viking use of wool for sail material as indicative of lots of things, including an innovative spirit. What brings us back to TGS, Inc. is that the Vikings (Normans) were a large influence on the culture of the mother countries. Too, though, this little paper by a student at MIT was intriguing: How a sail boat sails into the wind. So, we will need to look further at all things nautical; but, the land people will have their say, too. Case in point. From a common point that the Oregon Trail has with the Santa Fe (old culture) trail, one can follow the latter toward SF in a car. What we can do now in about three to four hours took the hard-working travelers of that time three weeks (21 or so days of 8 hours of labor, each) to cover. You see, on the boat, you laze about, if you are not part of the crew. On land? There is minute by minute solving of difficult problems albeit sometimes your work may be abetted by animal power (however, not, as we know from the Mormon cart experiences). 03/22/2015 - Gardner's Beacon, Vol. II, No. 2, had the theme of Gardners and the sea. 02/28/2019 -- This year, we're pulling together the contributions by John Goff, Salem Preservationist. We are in the process of completing the article (theme, Research in Progress) on Henry D. Gardiner and his barque, Bostonian, for the upcoming issue of the TEG. Notice that details have been removed from these posts as we will reissue them under Gardner Research (at the TGS, Inc. site) in order to support the footnotes (as in, each footnote in the article will be augmented with images plus links to on-line material). Here is a look at the Bostonian's timeline as of today. Notice that it left Boston in the spring of 1849. The ship took 173 days to get to San Francisco. Four passengers left Boston, and four arrived at SF. Then, we see an ad in Aug 1850, of selling at the Jackson Street Wharf. Before that, we see the Bostonian in New Zealand. Did they leave the booze in a warehouse and then return? This plaque tells the tale as it was known earlier in the 20th century. The 1994 effort at filling in the application for Historic Places added in some detail. We have gathered others. We left this comment at the Douglas County Historical Society page as they ought to be interested. Henry D. Gardiner, and his brother C.F., were the owners of the Bostonian. An article is scheduled to appear in The Essex Genealogist in May of 2015 that provides some background about the brothers. As well, it looks at Henry’s wives, two of whom were descendants of Thomas Gardner of Salem. Henry, himself, was a descendant of George Gardner of Rhode Island. His grandfather’s first cousin was Dr. Silvester Gardiner of Maine (see image in post). Silvester was the namesake of Henry and was the namesake of Gardiner, ME. So, the cities in ME and OR are named after someone in the same family. Then, there will be a timeline provided, based upon contemporary records, for H.D.’s and C.F.s’s barque. 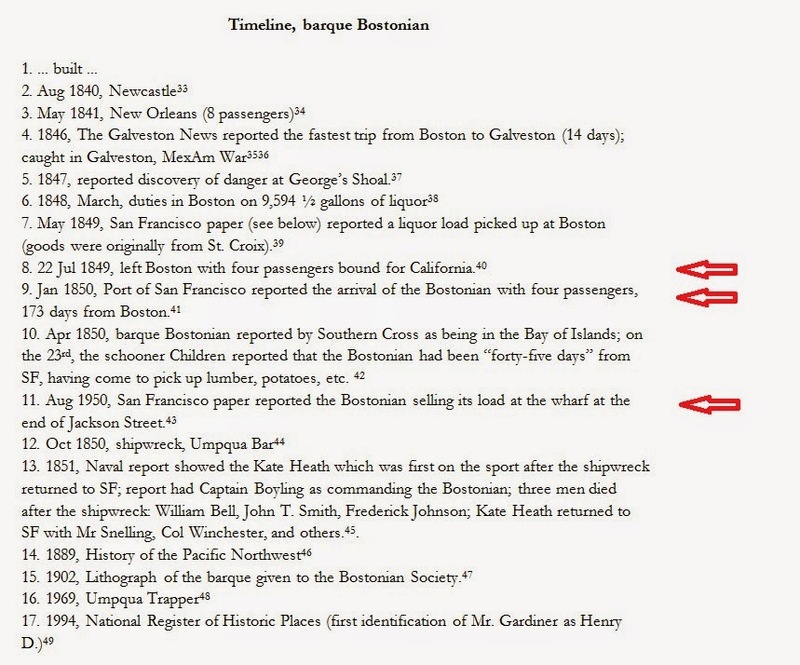 The Bostonian left Boston (May 1849 – there is a passenger list), was in SF (Aug 1849), and then, later, in New Zealand (April 1850) six months prior to shipwreck. The article will present what is known and will raise several questions that will need further research. As well, the article will look at Henry and his brother, CF. Plus, two of Henry's wives were descendants of Thomas and Margaret. 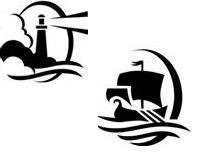 We will add in a little about Henry and CF after the shipwreck which must have resulted in losses for them, albeit folks on the scene were able to salvage a lot of material with which to start the town. George L. Snelling, purported nephew, remains a mystery. A Snelling returned to SF with the Kate Heath. 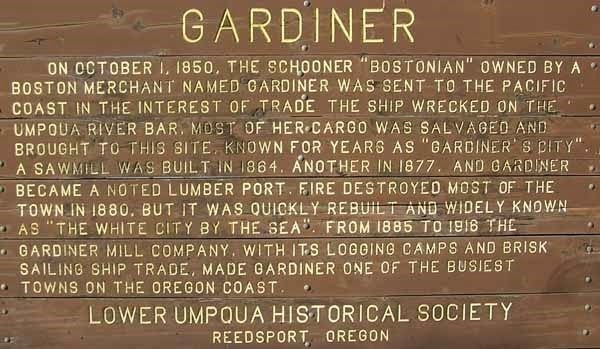 George was postmaster of Gardiner, at least, through 1854. Then, what happened? This is an example of westward movement that ties to New England and is thereby of interest. Too, we can see that facts are about, but they need to be gathered. Hence, motivation for research arises. The idea, here, is to get the facts written up, in an organized manner, with supporting sources, and see where future research goes. Too, some dates do not line up. We will report what has been reported; future work will sort out the issues. BTW, clipper ships made the around-the-Cape journey in about 1/2 the time or so. All sorts of nautical interests need to be studied (see sails - 03/09/2015). 03/18/2015 - We will post a draft of the article as soon as it is ready for general review. ... Changed the updated timeline (the ad was 1850 not 1849). 03/19/2015 -- The Aug 1950 was noticed. We hope to get feedback from the draft article which will be out later today. 05/20/2015 -- TEG, May 2015, Vol. 35, No. 2, Pg. 31. The Gardner Annals, Vol. II, No. 1, (see TGA, Vol. II, No. 1 - pg 6) will publish the article in the near future. The Salem Gazette published a column by John Goff on March 6, 2015, titled: Salem's Lost Carousels (link pending). John's second column will look further at the Gardner relationship. In the following (via email), John describes the research motivation and results. a) The esteemed Reverend William Bentley, of our East Church, reported in September 1799: "The place has been erected in Bridge street for the riding of the wooden horses, a newly introduced amusement of the Town." b) Benjamin Browne reported that it was JOSEPH GARDNER (a baker on Bridge Street, and descendant of Thomas Gardner)---thus another distant Gardner kin of ours...who "was the proprietor of the famous wood-horses, which were the delight and admiration of the boys of my day"
c) A Salem newspaper ad ran in 1800, promoting the Salem carousel---and commenting upon the health benefits (for increasing blood circulation)!! Joseph Gardner is #187 in Dr. Frank's 1907 book and is an uncle of Benjamin Brown Gardner.